The Embassy Suites by Hilton Atlanta Alpharetta, owned and managed by WCG Hotels, also known as Windsor Capital Group, Inc., celebrated the official grand re-opening of its newly renovated property by hosting a summer solstice reception for hotel guests and clients. Guests were treated to Chef Tyler Moler’s creative array of seasonal hors-d'oeuvres and craft cocktails while a jazz quartet provided entertainment. In attendance were several noteworthy event planners from the Alpharetta CVB including Anna Mikell, Jeanine Jones, and Hala Shell as well as numerous corporate event planners from the Alpharetta and Roswell area including Bryan Skalku, Sylvia Robertson and Mary Jo Malone. 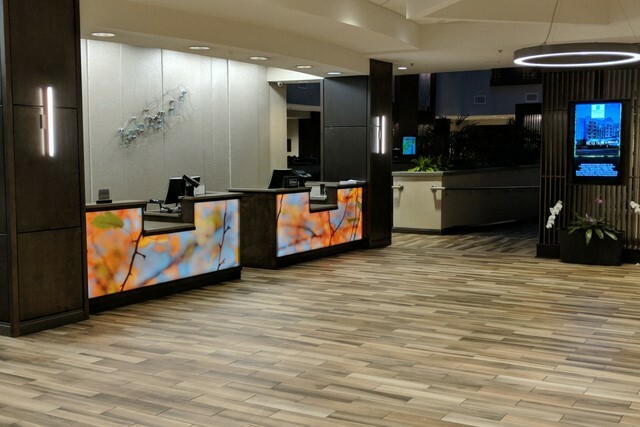 The Embassy Suites by Hilton Atlanta Alpharetta has just finished putting its final touches on their multi-million renovation, which began February of 2017. The guest suites, lobby, atrium, restaurant/bar, indoor pool, fitness center, and meeting spaces were completely transformed. As noted by General Manager, Cheryl Catrair, “It is great to see how excited the community and our guests are about the final results and I could not be prouder of our amazing team members for continuing to provide our excellent service we are known for during the renovation.” The renovated two-room guest suites now provide a plush bedding package, back-lit bathroom mirrors, 42-inch flat-screen TVs, interior paint, and new showers on the 6th floor. The atrium and public space areas have been transformed where guests have discovered flexible and efficient workspaces as well as and communal conversation areas. The 150 room all-suite hotel is conveniently located in Alpharetta's Northpoint District off Georgia State Route 400 at 5955 North Point Parkway and offers guests a perfect location providing easy access to top business and leisure attractions such as Verizon Wireless Amphitheater, Top Golf, Siemens, and Sanctuary Park. Just a few short minutes’ away, guests can discover the city’s premier shopping paradise; North Point Mall and the Avalon. The hotel is less than 30 miles from downtown Atlanta. The hotel features 2,400 square feet of flexible meeting space spread amongst four different meeting rooms, hosting numerous local, state-wide and regional events throughout the year and is a top destination for events such as family reunions and social gatherings. Embassy Suites by Hilton Atlanta Alpharetta provides guests with a full complement of services and amenities. Travelers enjoy free made-to-order breakfast each morning, a nightly complimentary Evening Reception* and spacious two-room suites with a separate living area, private bedroom, two flat-screen high-definition televisions and wet bar fitted with a microwave, mini-fridge, in-room safe and coffeemaker. Additional amenities include complimentary shuttle to malls including North Point Mall, Avalon and other locales within five miles, indoor heated pool, complimentary 24-hour fitness center, business center, and suite shop. Guests have access to digital check in where they can choose their own room and digital key access via their mobile phones for direct and hassle free entry to their suite. For more information or to make a reservation, visit http://www.embassysuitesalpharetta.com, call 675-566-8000 or visit us on Facebook. Embassy Suites by Hilton, one of Hilton’s 14 market-leading brands, is dedicated to delivering what matters most to travelers. The full service, upscale brand offers two-room suites, free made-to-order breakfast and a nightly two-hour reception with complimentary drinks and snacks. 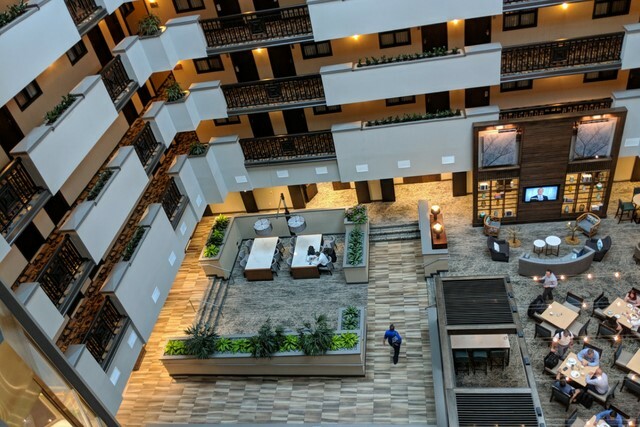 Both leisure and business travelers looking for a relaxed, yet sophisticated experience will feel right at home with brand-standard amenities like inviting atriums and complimentary 24-hour business and fitness centers. Embassy Suites by Hilton has 238 hotels with 48 in the pipeline. Hilton Honors members who book directly through preferred Hilton channels have access to instant benefits, including a flexible payment slider that allows members to choose nearly any combination of Points and money to book a stay, an exclusive member discount that can’t be found anywhere else, free standard Wi-Fi and digital amenities like digital check-in with room selection and Digital Key (select locations) available exclusively through the industry-leading Hilton Honors app. For more information, visit news.embassysuites.com. Windsor Capital Group is a hotel management and development company that owns and operates full-service, focused, upscale branded hotels throughout the United States, with the Embassy Suites and Marriott flags. It also runs Windsor Management Services, a top-performing hotel management company that customizes hotel management services to meet the needs of the properties. Windsor Management Services is an award winning, comprehensive hospitality management organization that operates full-service, upscale hotel properties throughout the United States. With more than 30 years of experience to call on, Windsor Management Services is known for unmatched results for its owners and unparalleled service for its guests delivered with a personal connection. For more information, visit WindsorManagementServices.com or WCGHotels.com. Contact is Paul Francisco, Chief Operating Officer at 310-566-1100.